Situated in the Southeast economic quadrangle where there are dozens of industrial parks with an extremely large force of workers and specialists, Dong Nai province has yet to have a class-worthy urban area. Bui Thanh Truc, President of the Board of Directors and General Director of DONACOOP Group, has spared no effort to plan the 1,300-ha Long Hung Open Economic Ecological Urban Area with the objective of building a civilised, modern and classy township for Dong Nai province, enabling to stay on par with many modern cities in the world. Long Hung commune previously covered seven poor communes in Long Thanh district, Dong Nai province (present-day Bien Hoa City). In spite of lying adjacent to Bien Hoa City and just 15 km from Ho Chi Minh City, the commune was connected to National Highway 51 with a rudimentary iron bridge. People here lived in poverty because of poor infrastructure, salty and acidic soil where crops could not be grown. Without stable incomes and livelihoods, most people had to sell their land piece by piece to speculators and brick kilns to have money to live on. That made this place increasingly deserted and desolated. In 2005 when the property market boomed, speculators rushed to buy land here. Because they bought to wait for higher prices, the scene here looked more desperate. Against this backdrop, Bui Thanh Truc as the head of the Management Board of Long Hung Cooperative persuaded competent cooperatives in the Dong Nai Cooperative Alliance to set up Dong Nai General Agricultural Service Cooperative (DonaCoop). He was credited and voted the Chairman of the Board of Directors and General Director to lead cooperative members to prosperity. Soon after DonaCoop was founded, he strongly recommended the Provincial Party Committee and Provincial People’s Committee of Dong Nai Province to convert uncultivable land where the State had to fund for subsistence into a green urban area which would help local people improve their livelihoods, serve as an extended residential place for increasingly crowded Bien Hoa City and shape a modern, pleasant and attractive space for all economic sectors. With 35 industrial zones, Dong Nai has attracted a large number of foreign experts, but it could not provide residences they want most. Every day, they had to move between Dong Nai province and Ho Chi Minh City. This cost their time and health while placing growing pressure on the traffic system. Meanwhile, Bien Hoa City was wearing a “too tight” cloak where there was no room for expansion and growth but beatification. Then, Dong Nai indented to develop Bien Hoa City southward to adjoin District 9 and Thu Duc District of Ho Chi Minh City. And, Long Hung, Tam Phuoc, Phuoc Tan and An Hoa communes of Long Thanh district (present-day Bien Hoa City) were planned to become an extended urban area of Bien Hoa City. After receiving the approval of Dong Nai province for the project establishment, Truc planned the whole of 1,300-ha Long Hung commune into a civilised and modern urban area, comparable to the modern city of Singapore. Long Hung Open Economic Ecological Urban Area took shape when the Party and the State adopted economic restructuring and collective economic reform. Showing their wealth of experience in finance, construction investment and real estate business, prestigious international contractors such as GHD (Australia) and AECOM (United States) and well-reputed investors such as Keppel Land (Singapore), VinaCapital Group (UK) and An Phu Long Joint Stock Company (Ho Chi Minh City) quickly found a long-term and enthusiastic Vietnamese partner for the future, DonaCoop Group, to have a common voice and carry out the project together. To make that wish come true, two joint ventures were founded: Waterfront Urban Development Joint Venture Company and AquaCity Real Estate Development Joint Venture Company. In 2008, leaders of Keppel Land Group (a leading real estate group in Singapore) and VinaCapital Group (UK) cooperated with DonaCoop Group to invest US$1.25 billion in the initial stage of the project, which will mount to US$10 billion upon its completion. During the starting phase, they carried out necessary steps like land compensation, site clearance, traffic and infrastructure construction and resettlement zone construction for relocated local people to create the space for the project construction. In 2012, land compensation, clearance and resettlement works were basically completed and the first phase of infrastructure construction investment was started. By the end of 2015, DonaCoop Group built 500 resettlement houses, schools and clinics and donated administrative offices to the government of Long Hung Commune, Bien Hoa City. According to Truc, the primary concern of DonaCoop Group and its joint venture units is bringing added value to local people and residents nationwide who come to live in this world-class urban area project. At present, DonaCoop is using its total force to synchronously carry out technical infrastructure investment, raise the foundation to avoid tidal rises, and build convenient traffic connection systems to draw secondary investors into the project. Long Hung Open Economic Ecological Urban Area has a unique location as it is surrounded by nearly 45 km of river ways and free from pollution of industrial activities, endowed with good soil foundation, favourable climate and weather, crowded population, located adjacent to Ho Chi Minh City and the gateway to North to South traffic routes via National Highway 1 and to the vast sea via National Highway 51. Truc said, the 1,300-ha project is surrounded by Dong Nai River, Ben Go River and Trong River and has as pure ecology as 300 years ago when General Nguyen Huu Canh arrived here to extend the national boundary. “This is the most liveable place today,” he shared. “In addition to serving local people, we want to target foreign experts working in Dong Nai province. How to keep them here always concerns us. A good urban area is not enough, but useful utilities must be also developed to serve residents and investors. In urban planning, we also consider building two river marinas to attract tourists and enable yachts to anchor along riverside villas of world-class entrepreneurs who come to Dong Nai and buy property in the project. In addition to resettlement, DonaCoop has provided jobs for displaced people who are working as motorised vehicle operators, freight carriers, tree planters, mason builders, mechanics, accountants, geotechnical engineers, bridge builders and information technology staff in the construction site. It is very hard for a unit to have the consensus of people living in a vast area, but DonaCoop did it. This is the result of practicality, harmony, balance of interests, and the heart of the investor plus the effort of local authorities to persuade people to understand and support the project. Many enterprises and missions from central to local levels in the country have come to learn DonaCoop's “for the people” approach. Bui Thanh Truc, born in Dong Nai province, joined the Southwest battlefield during the Vietnam War and went everywhere to earn a living and accumulate experience and knowledge before he started his business in the homeland. He devoted himself during the wartime, intermingled with the presently bustling and opening economic life to create a collective economic model for himself and for other collective members and contribute to the cause of industrialisation and modernisation of Dong Nai province. Currently, DonaCoop Group now has nearly 300 full-time employees who earn from VND6 - 12 million a month in addition to a nearly 1,000-strong regular indirect workforce with an average monthly income of at least VND6 million. In the past 10 years, DonaCoop and its partners have donated more than VND60 billion to charity and society works. To date, the group has paid nearly VND600 billion of taxes to the State Budget. Its independent financial resource has increased from an initial VND100 billion to more than VND1,500 billion. 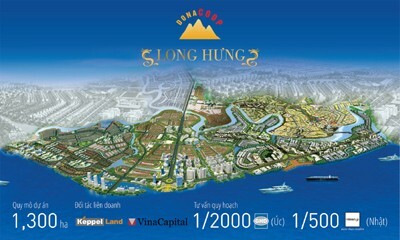 In addition to the gigantic Long Hung Open Economic Ecological Urban Area, entrepreneur Bui Thanh Truc has taken the lead in many innovative projects and grasp social development future with such projects as 22-storey Long Thanh Plaza Trade Centre which provides logistics services for prospective Long Thanh International Airport, Tan Cang 6 quarry project which supplies construction materials for decades to go, An Vinh Hang An Cemetery project, and a social housing infrastructure project in Tam Phuoc commune. His investment projects are gaining the increasing sympathy of the society and leaving positive impressions on local socioeconomic development. After more than a decade of construction and development, under Truc’s leadership, DonaCoop Group is now the leading bird of the collective economic model in Dong Nai province and in the country as directed by the Resolution of the Central Party. With its continuous contributions in the past 10 years, DonaCoop Group has been repeatedly praised as "Excellent Enterprise of Dong Nai" and Mr Bui Thanh Truc was recognised as “Excellent Entrepreneur of Vietnam” in 10 straight years and awarded the Third-grade Labour Order together with the Second-grade Labour Order for the collective. He was twice granted the Thanh Giong Cup, the recognition of excellent businessman, by the Vietnam Chamber of Commerce and Industry (VCCI). Great achievements and great ambitions go together with heavy burdens. Truc will continue to keep up his constant aspirations of developing modern cities for Vietnam on equal ground with the civilisation of the world, making people live in the healthy, pleasant, comfortable, smart, harmonious environment that brings health and happiness to them. "Just like Singapore, Long Hung Open Economic Ecological Urban Area must be a model land of the future world and a wonder of the river world, which is integrated actively with the civilisation of the world and is a worthy living habitat for businesspeople, intellectuals and dwellers from the Southeast in particular and from the rest of Vietnam in general,” Truc concluded.